John Zeleny was Emeritus Professor of Physics at Yale University (1940-1951). Other institutional affiliations included the University of Minnesota. He is best known for his work on electrical conduction through gases. March 26, 1872Birth, Racine (Wis.). 1892Obtained BS, University of Minnesota, Minneapolis (Minn.). 1892 – 1915Instructor in Physis (1892-1896); Assistant Professor of Physics (1896-1900); Associate Professor of Physics (1900-1908); Professor of Physics (1908-1915); and Acting Dean, Graduate School (1912-1913), University of Minnesota, Minneapolis (Minn.). 1897Studied at University of Berlin, Berlin (Germany). 1899Obtained BA, Cambridge University, Cambridge (England). 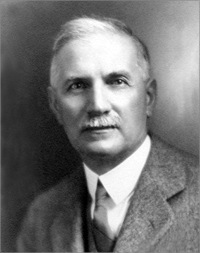 1906Obtained PhD in Physics, University of Minnesota, Minneapolis (Minn.). 1911 – 1914Member, Council, American Physical Society. 1915 – 1951Professor of Physics (1915-1940); Emeritus Professor of Physics (1940-1951); and Lecturer in Physics (1941-1943), Yale University, New Haven (Conn.). June 19, 1951Death, New Haven (Conn.). Advised by Zeleny at University of Minnesota, "The terminal velocity of fall of small spheres in air at reduced pressures." Research advisor at Cambridge University, B.A. thesis: "The Velocity of the Ions produced in Gases by Röntgen Rays." Obtained BS (1892) and PhD (1906). Instructor in Physics; Assistant Professor of Physics; Associate Professor of Physics; and Professor of Physics. John Zeleny Physics Today obituary.